As we have already seen, Barnet had established himself as a mariner, having been the Master of his father's ship the JOHNS. It was really Richard who took over the family position as a business man. Susannah also became involved in business in a small way as we shall see. Barnet had served several years as a ship's master when, on Saturday, 6th October 1824 he married at the age of 36. His bride, Fanny Elliot, was fifteen years his junior. Like the Princes, the Elliots were not an established Clovelly family. Fanny's father, John, had been a seaman, and the 1851 Census shows him as a man of 72, living at 109, Quay, and giving his place of birth as Kilkampton, Cornwall. He had married a Clovelly woman, Elizabeth Wade, and their daughter Fanny was baptised at Clovelly on 22nd July 1803. Fanny probably had a brother, John, since although his baptism has not been found, in 1871 a John Elliott, aged 62, is recorded in the Census as sharing accommodation with Fanny. Elizabeth Elliot died in Clovelly in 1859, and John in 1861. Over the next fourteen years the couple became parents to six children; Mary Ann was born in 1825; Susan in 1828; William in 1830; John in 1832; Barnett in 1837; and Barnetta in 1838. Of these children Mary Ann is not recorded on the 1841 Census, but she does appear in the 1851 Census at Hartland Manor, where she was employed as a Dairy Maid. So far no further trace of her has been found. Susan also does not appear again, except possibly in the 1841 Census, where a Susan Prince, aged 10, is shown as living with Richard junior. Unfortunately, this Census does not give details of relationships, and so it is not possible to tell if Susan is Richard's niece. The age discrepancy can be explained by the fact that in the 1841 Census records of age were often rounded to the nearest whole ten. William and John became seamen, and their story is told in the next chapter, along with what is known of the lives of Barnetta and Susan. Barnett unfortunately died when only a few months old, being buried on 21st September 1837 'aged 6 months 8 days'. As pointed out before, Richard became the real businessman in this generation of Princes, and there are several records of his activities. He possibly took on the tenancy of the Red Lion for a time, although as we shall see, this soon passed to another member of the family. The Princes' new vessel, the AGENORIA, was mentioned in the previous chapter. The ship was first registered at Bideford on 26th October 1818. Smaller then the JOHNS at 37 tons and 4lft length she was rigged as a sloop, and had been built at Clovelly by Thomas Burrow. The purchase of the vessel is also recorded on a document now held at the Public Record Office, Kew, where Richard is shown as the sole owner. In both documents the Master is shown as Barnet Prince. Richard re-registered the AGENORIA in 1825, Barnet again being the Master, but he relinquished this position eighteen months later to Thomas Whitefield, who in turn was replaced by John Marshall a few months later. Another recorded Master was William Pengilly, who took charge of the vessel in 1829. In 1828, Richard joined forces with his sister Susannah, and went into the ship-building business itself. On 22nd August of that year they jointly registered the HERO, a 24 ton, 38 foot long sloop, which they had built at Clovelly. Keeping things in the family, Barnet once again became Master. The Register of Seamen, 1835-1836, held at the Public Record Office, Kew, shows that Ticket No.9674 was issued to 'Peter' Prince, aged 47, of Clovelly. This is undoubtedly Barnet's ticket, as he is shown as Master of the HERO of Bideford. The next Register of Seamen, 1835-1844, has a copy of this entry, and also shows 'Peter' as sailing on the same ship in the second half of 1835, and the whole of 1836. The type of trading being undertaken with the HERO can be seen from the Agreements and Crew Lists for 1840, which show that the vessel made a total of 18 voyages in that year, carrying coal and culm between Wales and Devon. At this time Samuel Vine was Master, and the only other crew member was Barnet's father-in-law, John Elliott, now aged 63. The next recorded evidence of Richard's activities as a ship owner appears in the Bideford Registers on 30th May 1836 when he again re-registered the AGENORIA. This was because the vessel had been re-measured by the Surveyors of Ships. At about this time, many ships were being overloaded, and so they were assigned a lower carrying capacity, or Burthen. As a result, the AGENORIA was now reduced to being allowed to carry only some 23 tons. Meanwhile, Susannah had married Samuel Vine (born in 1801) in April 1834, and as a result of the law considering married women to not be the holders of any property in their own right, her half-share of the HERO passed to her husband. Confirmation of this can be found in a Registration entry of 12th August 1841. 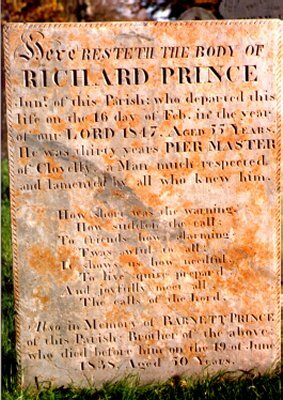 The couple were blessed with a son whom they baptised Richard Prince Vine on 28th January 1835. A second son, Samuel, was born in 1840. Tragedy struck the family on 19th June 1838, when Barnet died at the comparatively young age of 50. Cause of death is shown on his Death Certificate as 'Dropsy'. His widow, Fanny, was only 36, and her subsequent life can be traced through various sources. On 12th November 1843 the Clovelly Parish Register shows the baptism of George, son of Fanny Prince, although the boy had been born some three years previously, as on the 1841 Census George Prince, aged 9 months is recorded living with Fanny and her other children. In the 1851 Census George Saunders is living with his grandparents, John and Elizabeth Elliot, at 109 Quay. Finally, George Saunders Prince was buried at Clovelly on 28th December 1857, aged 17. In the same year Fanny Prince, widow, is found living with Caroline Beer in a house on the Quay. Her occupation is given as Nurse. By 1861, however, Fanny had remarried, this time to widower William Pengilly, a seaman aged 61. Williams' first wife, Grace, had died in 1845, leaving four children. Whether this is the same William Pengilly that was once Master of the AGENORIA is not known. Also living with them was Fanny's father John Elliott, now a widower aged 64. In 1871 the family were still living on the Quay, although John is absent, presumably having died at some time in the previous ten years. The final record of Fanny is in 1881, when she is again a widow, living on her own at 1, Mount Pleasant. Husband William had died in 1876. Her occupation is given as 'formerly Domestic Servant'. Fanny herself died in 1893. The family ship-owning business continued after Barnet's death, and Susannah's husband was master of both the AGENORIA and the HERO at one time or other. The Bideford Register of Ships shows that the HERO was 'lost' in 1849, although no details are given. The AGENORIA continued to be worked hard, as the Crew lists and Agreements for 1854 show that she made several voyages from Bideford to Newport in the first half of the year, on average three a month, with Samuel Vine as Master. In the second half of the year the vessel was commanded by Thomas Lemon, and then John Richards, who both alternated with George Cawsey. In this time she made 28 voyages carrying stone, 4 carrying coal, and 24 'coasting' voyages. The vessel was sold in December 1854. The 1861 Census for Avonmouth, Bristol, shows that a Robert Weeks, aged 23, was Master of the AGENORlA belonging to Clovelly, but that is the last mention of her so far uncovered. 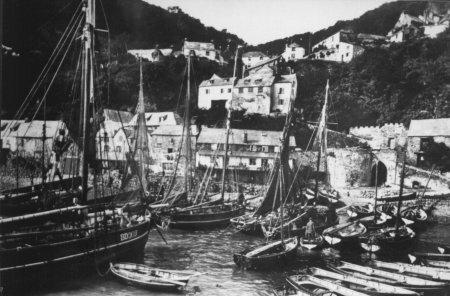 Richard's other major activity was farming, and he was the tenant of quite a large amount of land around Clovelly. Traditionally one tenth of all the main produce of the land and of both stock and labour was paid to the Church in the form of Tithes, but by the 1830's this system was becoming unworkable, and so the Tithe Commutation Act of 1836 allowed tithes to be commuted to a rent-charge based on the price of corn. A direct result of this was the production of Tithe Maps and Apportionments for virtually the whole of England, showing land ownership, tenancy and use. The documents for Clovelly show that Richard was the tenant farmer on just over 26 acres of land belonging to Sir James Williams. Included in this acreage was land surrounding the village, but most of it was in the Slerra and Wrinklebury areas. Included in this was a cottage and yard, possibly Richard's home. The Tithe map shows that this was situated on the side of the main road from Clovelly Cross to the Church, just up the hill from the Wrinklebury junction. As if to verify the adage that 'casualties do not come alone' a melancholy episode to the disastrous catastrophe occurred the same evening in the accidental decease of Mr. Richard Prince, aged about 55, a respectable farmer and limeburner belonging to Clovelly. The deceased had come into the market in the morning accompanied by two of his workmen, and bringing a quantity of wheat for sale, he sold his wheat and received the money (£9); he seems to have been addicted to drinking, and was in the 'London Inn' on the Quay, a little before 7 in the evening, drinking with a few of his neighbours; the alarm of the omnibus going over the Quay having been given, all his companions went out to see what was the matter, leaving him alone in the room; he must have gone out soon after, because a woman saw him excessively drunk, rambling towards the edge of the Quay, who ran over to him and led him up towards Cooper Street, where she left him; he was not seen afterwards alive, but the next morning between 9 and 10, his body was found drowned outside the Quay, just opposite Bridgland-Street. The face was shockingly eaten by the rats, and in his pockets above £13 was found. The body was taken to the 'Ship Inn' where an inquest was held upon it the same morning before Thos. I Pridham, Esq., coroner for the borough, when the above facts having been deposed to, the jury returned a verdict of 'Found drowned' . There can be no doubt that the unfortunate fellow, being greatly intoxicated, rambled over the Quay and so came by his death. It has been calculated that the modern equivalent of £13 is about £270! There is evidence that Richard left a Will, but, in common with all early Devon Wills, it was destroyed in an air raid on Exeter during the Second World War. The headstone, which also carries a memorial to his brother Barnet, reveals another string in Richard's bow, in that it states that for thirty years he was Harbour Master of the village. Susannah continued to live in the village until her death on 10th June 1870, and in fact she and Samuel took over the running of the Red Lion, which had been her father's business. In 1851 Samuel is recorded on the Census as an Innkeeper, and in 1861 as a Victualler. In 1851 their son Richard is not recorded, he may have been away at sea, but his younger brother, Samuel, does appear, aged 9. In 1861 both brothers were at home, and both are shown as being Merchant Seamen, following in their father's footsteps. Richard had married a girl called Susan, a year or so his senior, and she died in April 1877. They had one daughter, Annie Prince Vine who was born in February 1868, but died aged 10 in October 1878. Samuel junior was lost at sea in 1876, and a memorial to him in Clovelly churchyard, on the headstone of his parents Samuel and Susannah, reads "Samuel their son who left Larache on the 22nd of March 1876 and supposed to have been drowned off the coast of Portugal aged 36 years." In the 1871 Census Samuel, still living at the Red Lion, is now a widower. Whether he is still landlord is unclear, as he gives his occupation as Mariner. Also living at the pub were his daughter-in-law, Lydia, aged 31, a 'Mariner's Wife', and grand-daughter, also called Lydia, who was one year old. Lydia Mills, born in July 1839, was the wife of Samuel junior, and lived to the age of 96, dying in 1935. Samuel himself had passed away in 1876, and the 1881 Census shows the Red Lion being run by a Susan Jones, aged 32, who was the aunt of Susan (15), Lydia (11), Grace (9) and Georgina (7) Vine. So, at some time between 1871 and 1881 the Red Lion finally passed out of the hands of the Princes, after nearly 100 years, although the pub does figure in the story once more, as we shall see. Grace Vine, mentioned above, was born in 1871, and married Leonard Jewell, who was the same age. Leonard died in 1902, but Grace lived until 1952. Their son William Samuel Jewell was born in 1901, and died in 1990, having married Violet Crump (1899-1986). Their daughter Shelagh now lives in Exmouth, but remembers visiting Clovelly as a girl.